For starters, as Alexis observed in our last meeting, the image looks kinda like a movie poster. Look at the shading, how the center of the image seems to be illuminated. Check out the font. I’m with her, I can’t help but imagine “Now Playing” at the bottom. Intentional on the part of the designers or not, it’s no coincidence that this is what we thought of; we’ve been expecting this anniversary to be a “media event,” with loads of coverage and talking head-type stuff, so it’s no surprise that official graphics seem to reflect this by borrowing visual conventions from another kind of “big” media. 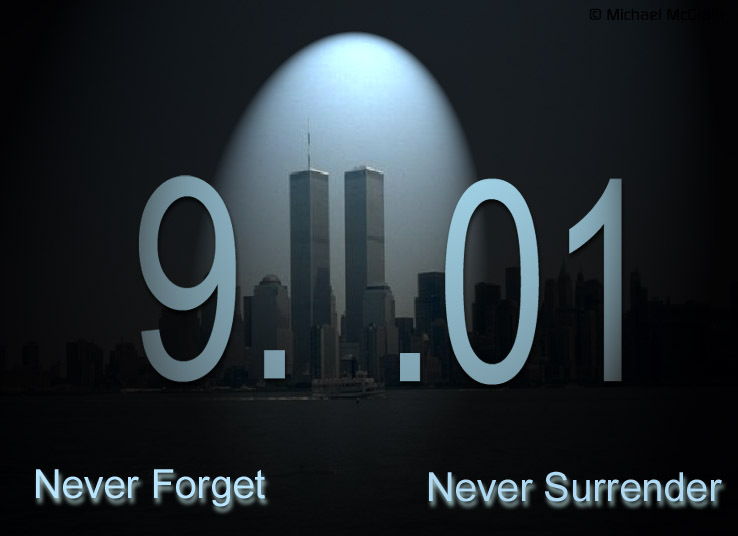 Secondly, of course, we have the “11” in “September 11” rendered to subtly resemble the twin towers themselves, searchlights and all. This is the closest thing to an actual pictorial representation of something that this image contains, and it’s a pretty obvious choice, for reasons other than, you know, they’re the twin towers. What I mean is if you’ve, like, even looked at a bumper sticker in the past decade you know that the twin towers, both before and after the collisions, have become part of our national 9/11 iconography—the twin towers, far more so than the Pentagon, have become the focal point of our national understanding of 9/11, I’m sure in no small part because stylized representations of them have likewise become a focal point of 9/11 commemorative graphic design and merchandise. Finally, in the background, we have a small portion of the list of the victims of the attacks. Although this feature straddles the line between textual and pictographic (a claim I feel comfortable making because the letters of the names are used mostly to add texture to the background of the image; they’re not really even legible unless you look closely), it still contributes to the overall interpretation of the event encouraged by the image. By listing the names of particular victims, the background reminds us of the personal nature of the tragedy, and also hearkens to the new 9/11 memorial at ground zero. But it’s telling, too, that these names are where they are—literally backgrounded behind the event/anniversary itself (represented textually in the form of a date), and the twin towers as described above. Almost as if to say that “behind all of this,” there’s a constant reminder of personal, real human loss. So, just from these three features of the image alone, we can start to see how the image dictates (or at least jives with) an interpretation of the tenth anniversary of the attacks as a media event, and how it makes use of both the overarching narrative of personal loss that has shaped our understanding of the event in the decade since and the visual tropes that we have come to associate with images related to the attacks. These event-logos images like this may seem somewhat ubiquitous and often not worth a second thought, but if we take the time to really look at them we can see the ways in which they encourage us to interpret events as strongly as (or maybe even more strongly) than any speeches. My analysis of this image draws very loosely on Systemic Functional approaches to visual analysis. Scholars have applied many core concepts from Systemic Functional linguistics to the analysis of visuals—notably the idea that communicative artifacts have ideational, interpersonal, and textual content (the referential content of communication, the social content of communication, and the relationship between the content and other examples of communication, respectively). I focused mostly on the interpersonal and textual functions of the image in my analysis above. You can find some good, more methodologically rigid examples of this kind of work in Multimodal Discourse Analysis: Systemic Functional Perspectives by Kay O’Halloran. Of course, Gunther Kress and Theo van Leeuwen are also total badasses when it comes to applying Systemic Functional linguistics to visual analysis. They literally wrote the book on it, it’s called Reading Images: The Grammar of Visual Design. And then when they got done writing the book on it, they wrote another. That one’s called Multimodal Discourse. In addition to movie ads, something about this image also reminds me of car commercials. But I got nothing to go on as far as that’s concerned.